I sometimes wonder, what’s so special about this cuppa tea… Mostly, I mix water, milk, tea leaves, sugar n ginger… !!! Is there any magic ingredient tat always makes me switch myself to a different mood??!!! It’s not always about craving or urging for it… If I was alone, wanted to think over certain things, to give myself some space… INTROSPECTION, I better say!!! It used to work… But for a long time now, I never feel like having it alone! :( Those countless cuppa tea I had wit so many buddies… while studying late night with school-friends, discussing projects with college-friends, working on desk with colleagues, while gossiping wit mum or mami n many more to list out! My 1st Cup of masala chai wit KG (my hubby), when we both were almost silent and just sipped on, tracing each other’s thought by own… Cup of tea that I shared with my lovely cousins, even though it was too milky n soft in taste… or pudina wali chai at Shrinathji are just never forgettable. Tea-party with Family last year, which was special in all way, as it gave me a chance to serve tea that I made! I like ginger tea, sometimes green tea, lemon tea works too… chai latte or masala chai works @ d best… never like elaichi tea!!! Does it matter? All what matters is non-stop chattering n a chai-partner while enjoying each sip…..
Yes… emotions mixed up in today’s cup n made me nostalgic… Missing u all buddies! – Mix water, tea and sugar in a vessel. – Bring them to boil on low flame. – Add milk, full cream and cinnamon powder into it. – Again bring it to boil and strain them into mugs. 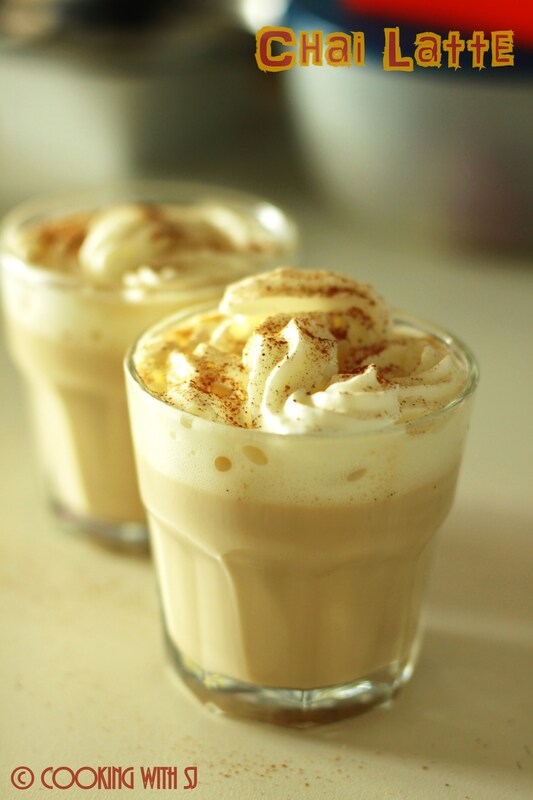 – Top with whipped cream and garnish with a pinch of cinnamon powder! Well this is new :) Lovely click !